We have a large selection of cool math games for teaching high school math concepts and logical thinking. Check out the Cool Math Games section. Want to learn high school math the fun way? Or practise your math skills without noticing? There are a number of high school math games for high school on the Funmaths website. We'll help you cover all sorts of math concepts like fractions, algebra, geometry, number skills and more. But also, importantly, you'll learn additional general math skills like logic and spatial skills. Math puzzles can be very unusual and entertaining. Perhaps you'll find math is more interesting than you expected! Often you won't even notice that math is involved. But you'll be exercising and stretching the math side of your brain. Teachers! 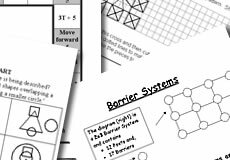 We've also got a number of entertaining math game & puzzle worksheets. On Funmaths.com we also have a number of cool math games. 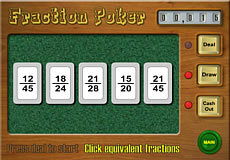 Play poker by matching equivalent fractions. Suitable for students in year 8 or 9. Play Fraction Poker online. 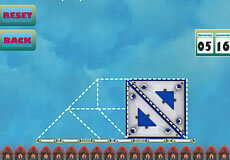 These shapes are two large, one medium and two small triangles, one square and one parallelogram. 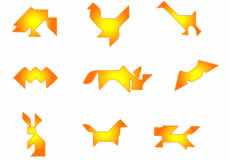 From these simple tangram pieces a range of complex shapes can be made. Many simple shapes have a surprising underlying complexity. Funmaths GameStationis was a set of computer games for years 7 to 12 students that brings the major mathematical concepts to life. Click here for more information.